Do you like to paint your miniatures? Embellish them? Customize them? 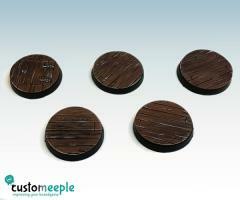 This is your chance to give them a different feel with these new base toppers that will add variety to your collection. All the decorations are fabricated in High Density cardboard: A durable cardboard material for modeling very similar to MDF. You won't notice much base thickness increase since they are extra thin at only 0.32 mm thick. This pack contains 5 toppers for 25mm bases (Warhammer 40k, Infinity) or 30mm decorative bases (Malifaux – Warmachine) etched with a themed design. Glue them to the appropriate plastic bases and paint them to make each design unique.